The Osmio PRO-II-A Advanced Whole House Water Filter System is our one of our top of the range and finest whole house water filter system for those seeking nothing but the very best. 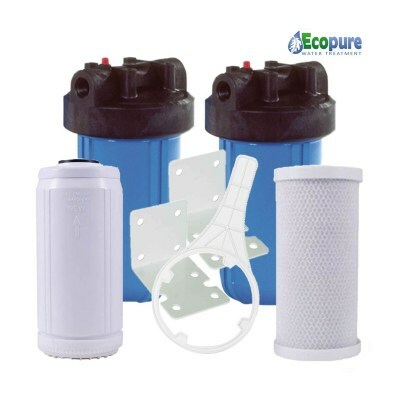 The first filter is the Active Ceramics Large Whole House Filter which uses an advanced formulation of active-ceramics which are highly effective at reducing a wide array of water impurities including chlorine, toxins, heavy metals, hormones and fluoride. 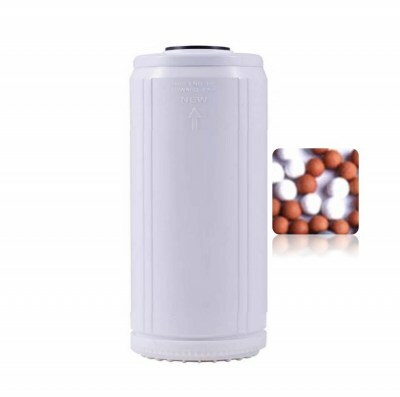 This filter is also highly advanced and effective at killing and containing bacteria in water such as E-coli, Pseudomonas and other microorganisms. The filter uses a unique filtration method using a patented active ceramics blend, so it has 4 different active ceramics which treat the water in a different way and is completely unique. Not only that but the filter adds antioxidants and minerals back into the water after filtering and additionally makes water more alkaline by raising the pH value, usually increasing the pH to around 0.5 a point or more (however this could be more or less depending on a number of specific variables including the presence of certain dissolved solids and gases). This first filter is the main cartridge and is replaced every 3 years or 300,000 litres. The second filter (which is an upgrade from the standard Osmio PRO-II System) is a 5 micron carbon block. 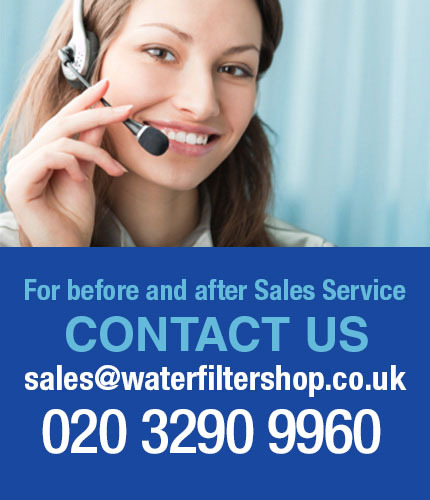 This filter further reduces chlorine and nay taste and odour issues that may be present in the mains tap water. The carbon block also reduces certain Volatile Organic Chemicals (VOC) from drinking water. The coconut base of the carbon also makes a slightly sweeter taste which is pleasant. The carbon block has a very high dirt holding capacity with virtually zero pressure drop. The filter is rated for 46,000 litres so is usually changed every 6 months. At the end of the life of the main cartridge, you can take out the ceramics and use it to fertilize your garden to improve the health of plants or grass and soil drainage. The plastic housing can be put through your normal recycling waste. Housing and Cartridge are both WRAS approved. Active Ceramic and Post Carbon Filter are both NSF certified. Ideal for medium/large home with pipework up to 1” diameter. Post filter required for polished water and removal of sediment including dust, rust and other particulates. 1 x Active Ceramics Large Main Filter - 3 year filter life or 300,000 litre capacity. Life of filter may vary depending on water hardness and local water quality. 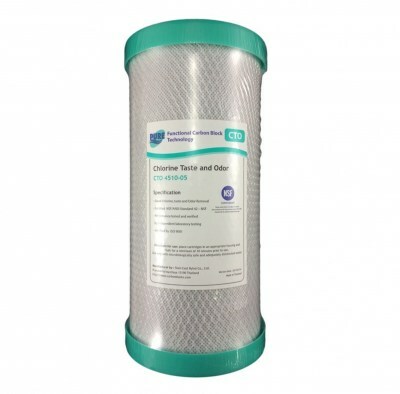 2 x Watts 4.5 x 10 Inch 5 Micron Carbon Bock - filter life 6 to 12 months depending on usage. 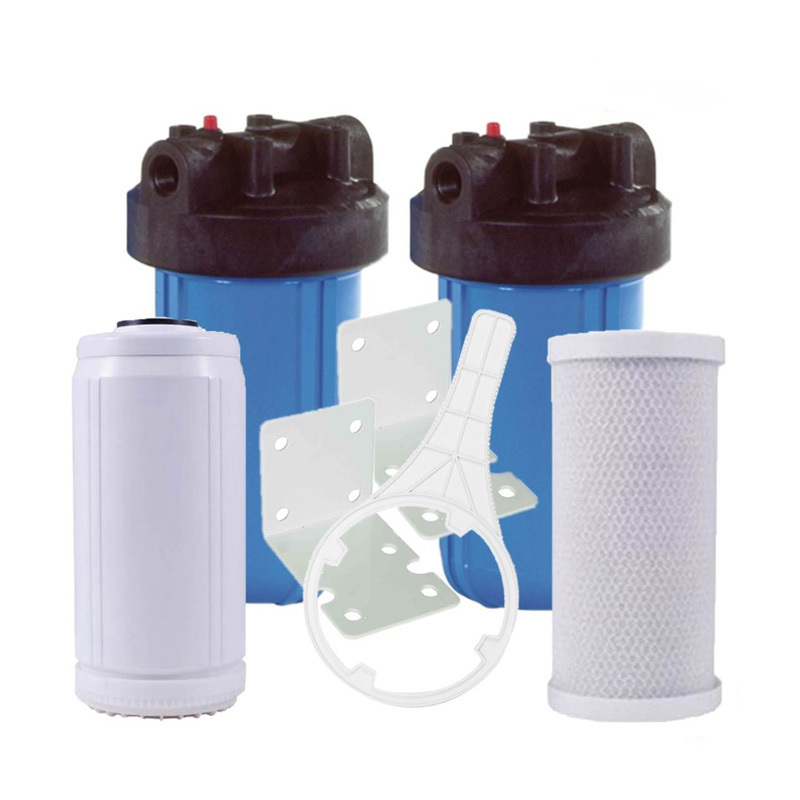 Full Kit includes filters, full flow blue housings with 1" BSP female ports, brackets with screws and large housing spanner. System is supplied as two separate housings to enable greater flexibility when installing the system (e.g. when installing in an L-Shape or one on top of the other). Flow rate: filtration designed to work up to a peak of 40 litres per minute. Big Blue housing and cartridge - WRAS approved. The material of the spheres is approved by the Water Research Centre under the Water Bylaws scheme for use in contact with potable water. NSF approval has also been granted. The active ceramic media has been tested by South West Water Laboratories for microbiological removal and certified for bacterial removal.